Warner Japan Special limited SHM-SACD reissue series! World premier release on SACD! SHM-SACD stands for Super High Material Super-Audio CDs. This is a single-layer, stereo-only SACD pressed on special SHM discs utilizing high-quality polycarbonate material originally developed for LCD panels. Following Universal, Warner Music Japan began reissuing its jazz titles on SHM-SACD, including classic records from Atlantic label. 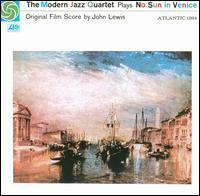 Plays No Sun In Venice is a standout in MJQ's early recordings, a collection of six John Lewis compositions that were used in the French Film No Sun In Venice. The versatile group was perfect for this type of music and these thought-provoking performances reward repeated listenings. This SHM-SACD was released in Japan on February 23, 2011. 2011 DSD remastering based 24-bit, 192kHz PCM masters sourced from the U.S. Mono.